Before beginning my dissertation research at the Wellcome Library my understanding of astrology was, like most people’s, limited to my star sign (Taurus) and reading the occasional horoscope in the paper. As a medieval art historian, I had some sense that the stars played a role in the Middle Ages, but never quite understood to what extent. It was only as I examined late-medieval astrological medicine that I began to understand the very palpable influence the heavens had on many facets of medieval life. Celestial movements might determine the outcome of a battle or explain a personal character flaw, but, beyond such functions, astrology helped to maintain health through medical practice. For me, these practices finally came to life in the pages of MS. 40, inspiring me to understand better both the practice and the tools which enabled it. Even after seeing the restricted manuscript under the guidance of Gillian Boal, Head of Conservation at the Library, I must admit that MS. 40 is fairly unimpressive at first glance. Its pages, folded like road maps, are obscured by a stiff parchment binding scuffed by curious hands over the years. 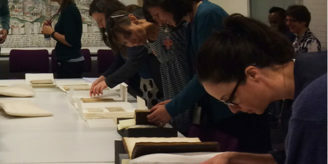 However, upon lifting this rough cover, one is invited to work through its pages, folding, unfolding, and turning each folio to reveal extensive sets of data laid out in tables, figures, and diagrams. As you work through the manuscript, it is easy to imagine the physician flipping through its pages. Attached to his belt by the sturdy tab, he would not even have had to remove it from his garment thanks to the careful orientation of the text. Still, the content itself remains obscure and intriguing to the uninitiated viewer. Luckily this content is not so complicated as one might think at first glance, and initiation into the world of astrological medicine can be achieved by examining the two human figures hidden in the manuscript’s pages. First, however, it is important to understand the general medieval conception of the universe and man’s place in it. Based on their understanding of classical learning, medieval people understood man to be a microcosm that mirrored the macrocosm in which he (or she) existed. For example, just as the moon, stars, and planets were made of four elements (fire, water, earth, air) so too was man composed of four humours (yellow bile, phlegm, black bile, blood). It is little wonder then that medieval physicians looked to the visible heavens for the treatment of ailments whose cause often remained invisible. Though they practised in an unstable environment rife with disease, malnutrition, and high childhood mortality, the heavens offered measurable insight based on observable phenomena. The most pertinent application of MS. 40 within this context of astrological medicine is through the widespread practice of phlebotomy. Phlebotomy, better known as bloodletting, may seem macabre today, but it was a trusted treatment for medieval practitioners. By prescribing bleeding for a patient from a particular point on the body, physicians believed they could treat specific ailments. The first figural drawing in MS. 40 exists for just such a purpose. 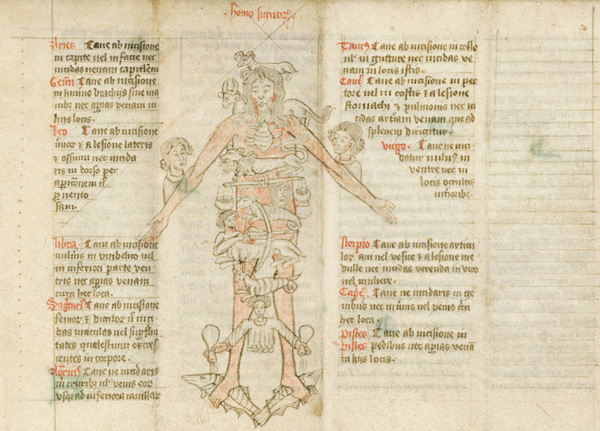 The form of a naked man found on the fifth folded page is accentuated by red indication lines that lead to succinct admonishments concerning the appropriate place to bleed from in order to effect a cure. For example, the text linked to the figure’s head states Vena in medio frontis incisa purgat einoydas [haemorrhoida/emorrhoida] et frenesim iuvat, advising that a vein cut in middle of the forehead cleanses haemorrhoids and alleviates frenzy. This ‘vein man’ who seems to hover on the page provided a visual reference for the practising physician. Still, bloodletting was not merely a matter of where, but also when, and it is these temporal concerns that provide a more inclusive sense of the manuscript’s purpose. Moving on from the vein man, folding and unfolding two more pages, one will find the second figural decoration in MS. 40: a man whose dignity is only preserved through the careful placement of the zodiac signs. This strange image represents one of the keys to understanding the relationship between astrology and medical practice through the ‘theory’ of melothesia. Much like a person is associated with a particular sign, this theory links particular parts of the body to zodiac symbols. This invisible relationship between body and heavens was believed to result in physical symptoms. With concern to blood, the heavens’ influence on the body meant that, as the moon moved through a particular celestial sign, blood would pool in the corresponding body part, making phlebotomy potentially dangerous. In order to bleed a patient safely, doctors were advised to avoid bleeding from parts of the body where blood might be pooled at any given time. When combined with the earlier vein man, these two diagrams offered a when and where for effective purgation. But these figures do not exist in a vacuum. 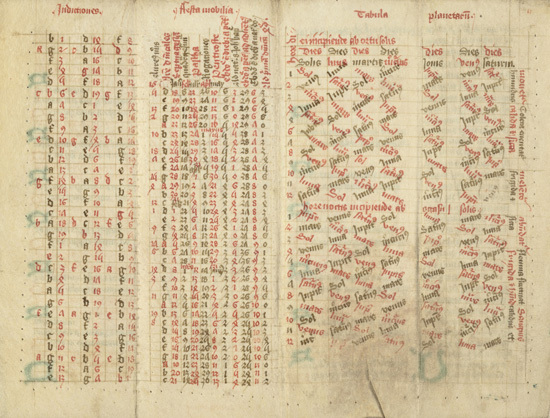 They are surrounded by various tables and diagrams which provided the astronomical calculations necessary to track the movement of heavenly bodies throughout the year as defined by the liturgical calendar. These pages acted as a helpful reference for physicians, so that they might know the astronomical and astrological conditions with respect to the onset of an illness, treatment, etc. 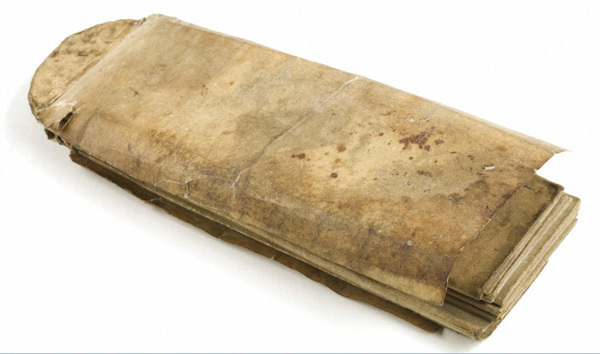 The manuscript’s folded format packaged the maximum possible amount of information in the smallest, most transportable size, making it a useful reference tool for the often-peripatetic practice of medieval medical practitioners. 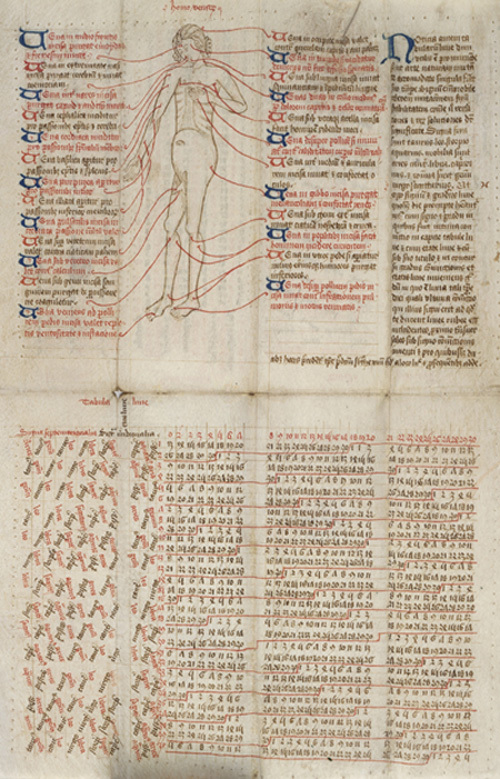 This idea of MS. 40 as a reference material offers a final insight into medieval astrological medicine. Instead of viewing astrology as simply superstitious, many during this period saw it as a science backed by mathematical calculations. It offered a sense of visible certainty within the obscure and uncertain realm of medicine. While my research into MS. 40 and medieval astrological medicine has not made me trust my horoscope, it has certainly changed my perspective on medieval medicine. Like our scientist today, medieval physicians too sought to understand the world around them, ordering it a manner that gave them some control over the unruly human body. Author: Adrienne Albright was a placement student at the Wellcome Library from March-July 2013. 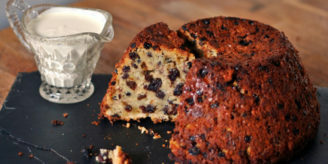 She recently completed a Master of Arts degree at the Courtauld Institute of Art. both by medics and the general populace. I also think that some of the Shakespeare’s plays also back this up. [e.g. The fault is not in the stars; but in ourselves – Julius Caesar].